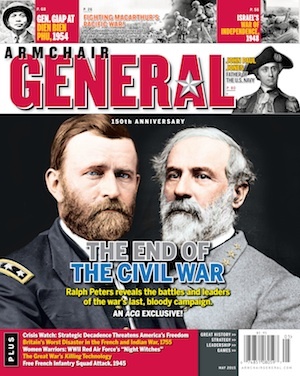 National Campaign to Save Revolutionary War Battlefields | Armchair General Magazine - We Put YOU in Command! (Princeton, N.J.) – Nearly 240 years after the “shot heard ’round the world” signaled the beginning of the journey toward American independence, historians and preservationists gathered in Princeton, N.J., to launch the first-ever national initiative to protect and interpret the battlefields of the Revolutionary War. The new effort, titled ‘Campaign 1776,’ is a project of the Civil War Trust, the nation’s most successful battlefield preservation advocate. Campaign 1776 will employ the same proven strategy of harnessing public-private partnerships to permanently protect hallowed ground that has made the Civil War Trust one of the country’s top charitable land conservation organizations. Although primarily focused on preservation of the battlefields of the Revolutionary War (1775-1783), Campaign 1776 will also target battlegrounds associated with the War of 1812 (1812-1814) – the conflicts that established and confirmed American independence from Great Britain. In its 2007 report on the status of these battlefields, the National Park Service found that of the 243 significant engagements of those conflicts, only 100 retained historic integrity. Those sites that have endured through more than two centuries are now facing pressure from residential and other development. In addition to announcing Campaign 1776, Lighthizer also revealed the first preservation project of the new national initiative: a fundraising campaign to save 4.6 historic acres on the Princeton Battlefield. The January 3, 1777, engagement was General George Washington’s first victory over British Regulars in the field, and a turning point in the war. In this effort, the Trust is working in partnership with the State of New Jersey, local governments and the Princeton Battlefield Society. It will mark the first addition to Princeton Battlefield State Park since 1971. To learn more about this transaction, or to contribute, visit www.campaign1776.org/princeton2014. Princeton Mayor Liz Mepert and Richard Boornazian, the state’s assistant commissioner for natural and historic resources, representing the governmental entities integral to the project, similarly welcomed the availability of a national battlefield preservation group to help facilitate such local land preservation efforts. The existence of government matching programs, like New Jersey’s Green Acres program, and the active participation of historic communities like Princeton, are critical components of battlefield preservation efforts. Campaign 1776 had its origins when representatives of the National Park Service (NPS) approached the Civil War Trust about expanding into Revolutionary War and War of 1812 preservation, in light of pending federal legislation that would create a unified pool of government matching grant funding for the protection of battlefields from all three conflicts. After careful consideration and analysis of both the stark reality of what would likely befall these battlefields should they demure and any potential impact on the organization’s primary mission, the Trust board voted unanimously to move forward with a controlled and measured extension. In accepting this challenge now, the Trust has the benefit of tools never before available to preservationists, even beyond the approaching availability of federal land preservation matching grants. For example, NPS and the Trust are partnering to undertake an unprecedented GPS mapping study of Revolutionary War battlefields. Moreover, the American Battlefield Protection Program’s report on the status of Revolutionary War and War of 1812 Battlefields, modeled on the landmark study of the Civil War Sites Advisory Commission, provides a prioritized roadmap for preservation of these battlegrounds. Becoming a member of the new initiative is fully voluntary for Civil War Trust members; conversely, Trust membership is not a prerequisite for joining Campaign 1776. Working in parallel to existing efforts, Campaign 1776 will provide advocacy and public education opportunities for Revolutionary War and War of 1812 battlefields in the same manner the Trust has done for Civil War sites. Additional details on organizational mission, structure and membership are available at www.campaign1776.org. Campaign 1776 follows in the spirit of the modern battlefield preservation movement that began in 1987, when a group of historians concerned with the destruction of suburban Virginia battlefields formed the Association for the Preservation of Civil War Sites, today the Civil War Trust. Donors are invited to support individual projects, presented with historical context and illustrated on maps, where the availability of federal or state matching grants and major donor or foundation gifts can multiply each contributed dollar several times over. The Trust works only with willing sellers, paying fair market value for land that will be protected in perpetuity through fee simple purchases and/or conservation easements. The Trust also has a reputation for working cooperatively with developers to seek out well-planned projects that allow for community growth and vitality while respecting irreplaceable historic resources. The Civil War Trust is the largest nonprofit battlefield preservation organization in the United States. Although primarily focused on the protection of Civil War battlefields, the Trust also seeks to save the battlefields connected to the Revolutionary War and War of 1812. Through educational programs and heritage tourism initiatives, the Trust seeks to inform the public about the vital role these battlefields played in determining the course of our nation’s history. To date, the Trust has preserved more than 40,000 acres of battlefield land in 20 states. Learn more at www.civilwar.org, the home of the Civil War sesquicentennial. Campaign 1776 is a national initiative of the Civil War Trust, America’s largest and most efective battlefield preservation organization. Its purpose is to protect the battlefields of the Revolutionary War and War of 1812, and to educate the public about the importance of these battlefields in forging the nation we are today. To learn more, visit the Campaign 1776 website at www.campaign1776.org.